When it comes to your wedding day, you want everything to be perfect. Not only is it one of the most important days of your life, but it is also a big investment that you want to protect. In fact, the average wedding in 2017 costing brides, grooms, and their parents a whopping $33,391 — and that doesn’t include the honeymoon! With that type of investment, you don’t want a hair to be out of place. So, in today’s blog, we’re getting real about how to ensure everything comes together on the big day! Contracts are very important and can hold vendors responsible for delivering what they promise. Any vendor you work with, be sure to sign an agreement stating what they are responsible for and how much you will pay them. Even if your best friend does photography on the side and offered to shoot your wedding for free. Get it in writing and have everyone sign a contract so no one freely backs out at the last minute. Along those same lines, get everything in writing. If you visit your venue and your venue coordinator says something like, “We’ll have a sound system available, so don’t worry about renting one,” follow up with an email after the visit and say, “You mentioned your venue has a sound system available for me to use at my wedding on December 22. I want to confirm that that information is correct.” And then make sure they email you back and confirm it. Do this after every phone conversation or face-to-face conversation with all of your vendors. It helps create a paper trail and holds people accountable. While putting all of your eggs in one basket is typically frowned upon, there are certain reputable vendors (like us!) who offer many of the wedding rentals you will need on your big day. Because all of your tables, chairs, linens, tents, centerpieces, audio equipment, dance floor, and other decor will come from one vendor, you can save some stress on the day-of by having to contact fewer vendors. Please, please, please read every single piece of paper you sign during the wedding planning process. 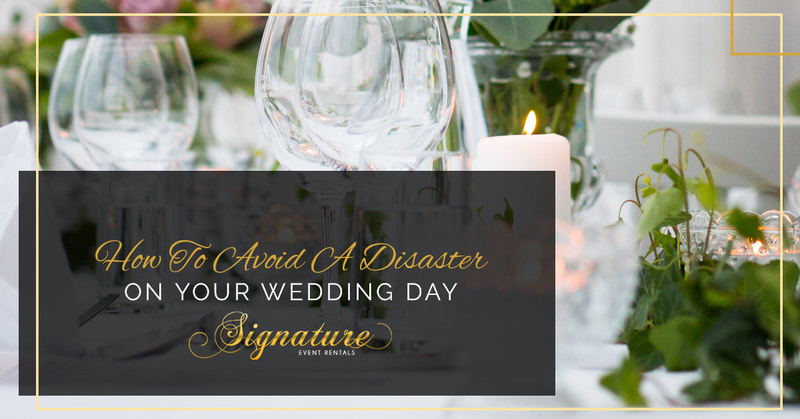 You likely signed a contract for your venue that had some fine print and stipulations about what is allowed, what is included, and what is forbidden. For example, your venue contract might say you cannot use any glitter, throw rice, or tape decorations to the walls or ceilings. Some venues even ban candles, don’t allow hard liquor, or includes clauses in their contract like, “If you don’t use one of our approved caterers you will have to pay a $200 fee as well as $10 per person.” If you have your heart set on anything specific for your wedding day, make sure you read the full contract and ensure you can go through with your plans. Weddings do not need to take a year to plan, but there is certainly a reason for getting started as soon as possible. If you are getting married on a Saturday during peak wedding season (typically late spring through early fall, as well as December), your choice of venues, photographers, caterers, and all of that is going to be, frankly, slim pickins. The earlier you plan, the more choice you have to get exactly what you want. Along with getting everything in writing, don’t be afraid to remain in contact with your vendors, coordinators, and planners. You don’t need to call and check in every week if you have signed your contracts and believe the vendors are reputable, but a quick phone call or email at six to three months ‘til, the month before, week before, and day before can’t hurt and will give you some peace of mind that everything is going to happen as planned. Even indoor weddings are subject to weather-related turmoil. The last thing you want is to walk through muddy puddles and have the rain ruin your makeup as you enter the venue. Have a couple of umbrellas prepared, and if there’s mud or rain on the ground put on some rain boots, hike up your dress, and be careful not to slip on your way into the church or ceremony venue. Outdoor venues are much more susceptible to rain, and having a wedding tent rental on standby can ensure there is no last-minute panicking. If your wedding is in Fredericksburg or the DC area, give us a call a couple months before your wedding and we can discuss our expected availability. If you’re having your wedding on a Wednesday in January we might have something available at the last minute, but if you’re having a wedding during peak season on a Saturday you might consider reserving a tent just in case. Even if you don’t think you want a tent, it’s always nice to have for guests to escape from the sun. Need Wedding Rentals? We Can Help! If you need a trusted company for your wedding rentals, Signature Event Rentals is here to fill the role! We’ll arrive early and help set everything up to make sure your big day is perfect! Shop our wedding rentals today!